I'll be damned. Don't think I've ever seen that before. Cool! You guys are giving me BAD ideas for something unique to do for my 67 Barracuda.. Dunno if I can pull off the organisol/flat black treatment, but the stripes look -awesome-.. I'm diggin it! ...maybe I'll roll the paint on and have the stripes stenciled off and taped by one of those graphics places that advertise in the mags.. It's the only one I have ever seen in the 11 years that I have owned this car. I can believe that. Tough to guess how many came with V21 since you hardly even see 75 Road Runner's. But I'm sure not many were made with V21. How many did that make total? I've seen a red w/black stripe one and a white w/gold stripe one at Spring or Fall Flings over the last ten years. Neither will blacked out hoods. But never did look at the fender tags. The white one could have been original paint though. I`m more than willing to be proven wrong, but I was under the impression that Hood Blackout was unavailable on 71 Challengers? According to production figures approximately 418 R/Ts and 62 non-R/Ts came with it. Was that just not the large `R/T` Decal? So what would the 62 non-R/Ts with V21 have? I've never cared much for the 75s, but that's one SWEET looking car! And I love to see something different. 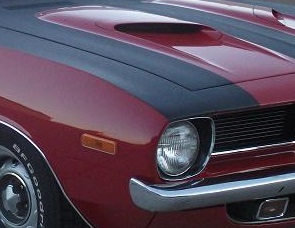 I have a 1972 Cuda with the V21 option on my data tag. I believe this was a 72 only option for Cuda's. Mine also came with a color keyed grill (which is not on the data tag??) and I do not have a build sheet. Dude, do you have any more pics of that car???? Well, where exactly is the best place to get the correct organsol paint? I know Year One NOW sells it for like 150.00 + for a quart. I need to repaint my hood. It was done in an egg shell enamel paint. Any one got any suggestions? I would like the correct texture and something that will spray directly over acrylic enamel paint. Had rather not use a primer but will if I have to. I have heard of some PPG paints that are close but some say use a medium thinner while others say a slow thinner. Here i s picture of my Demon with the V21 option.